The UniverSoul Circus, now hailed as America’s No. 1 Circus, comes at you like a high-speed rollercoaster. It’s a once in a lifetime thrill-a-minute spectacle of sight, sound and soul for the entire family to enjoy. 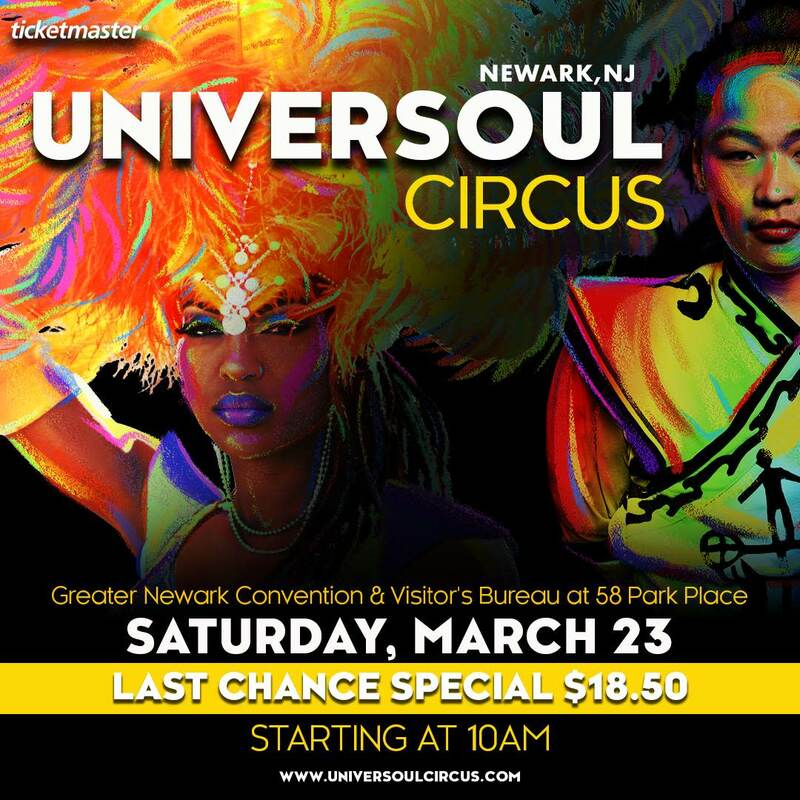 Celebrated around the world for spreading a soulful dose of unity, inclusion and diversity under its red and yellow striped big top, UniverSoul Circus announces 2019 tour dates in Newark, NJ, April 3-14. UniverSoul Circus, is loaded with one-of-a-kind performances from around the world – all coming together as one under a single ring big top. Led by Ringmaster Lucky from South Africa and his long time Sidekick Zeke, the 2019 edition of UniverSoul Circus features contortionists from Guinea, Skaters from Cuba, Daredevil Motorcyclists from the United States, a High Wire Act from Colombia and Gabon, Trampoline Acrobats from Cuba and Ethiopia, Teeterboard Drillers from Mongolia, Solo Trapeze from Brazil, Trick Rescue Pooches from Colombia and Russia, a Cossack Horse Act from Kazakhstan, Cuba, Guinea and Mexico, Fresh the Clownsss from the United States, and many more surprises. UniverSoul Circus offers an incomparable experience for live-entertainment lovers, bringing showgoers and performers together closer than ever before in an inclusive, jovial and soulful atmosphere. Participants are immersed into a global dimension, drawing multicultural, multinational, and multigenerational bonding through performance art for all people to enjoy and be entertained. Celebrating 26 amazing years in 2019, UniverSoul Circus is a highly interactive combination of circus arts, theater, and music that spans genres including Pop, Classic R&B, Latin, Hip Hop, Jazz and Gospel. It embraces and celebrates the unique and familiar aspects of pop culture globally by bringing them center stage with a cast of international performers. UniverSoul Circus is rated as one of the top two circuses in America along with Cirque du Soleil. UniverSoul’s fresh approach to family friendly live entertainment has garnered it a coveted spot as one of Ticketmaster’s top ten most requested family events, along with other shows including Sesame Street Live, Disney on Ice, and Radio City Christmas Spectacular. The circus was founded 26 years ago in Atlanta by concert and theatre promoter Cedric Walker.